Learning prepositions first helped us eliminate confusing nouns and pronouns from the beginning. Years ago, when our sons were in the 1st grade and 3rd grade, I homeschooled another boy who was in 5th grade. (All the boys are now in their 20s now.) Last year, this young man just wrote me a letter out of the clear blue, completely unsolicited, about a college English class. Its something I will always treasure. I would love to share it with you because it drives home the point that if you make learning fun, they will remember it longer. The year he homeschooled with us, we used Easy Grammar AND Grammar Songs. “Dear Mrs. Cooper, Thank you for teaching me grammar. I am back in college working on a degree in industrial engineering (robotics). Before I get to the technical courses, I must complete English Composition, among other basic classes. Our teacher also teaches grammar, and so emphasized it in our class, insisting that grammar is absolutely essential in order to write compositions. (I agree, of course.) To my amazement, the whole of the grammar he’s teaching us, which is challenging and confusing to many of the other students in my class, was taught to me by you in the fifth grade, and I remember it all! Prepositions, prepositional phrases, direct objects, indirect objects, subjects, predicates (verbs: main, helping, linking), predicate nominatives, predicate adjectives, adjectives, adverbs, nouns, independent (main) and dependent (subordinate) clauses (and the comma rule), articles, phrases, etc. are all being taught in college! The teacher often expresses his disappointment in the public educational system, and reminds us that “this is college now” and “you should have learned this in high school.” Thanks to my experience in your class, this course is an easy A. Sincerely, AL"
· Answer key and teaching strategies are contained in teacher edition only. ·Writing section "teaches" how to write items in a series and appositives. · Each DAILY GRAMS contains 180 reviews. Do one every day as a review to aid in Mastery Learning! · General review of nouns, verbs, etc. · Concepts are set up so that review usually occurs within twenty-five days. Use these the first 10 minutes of your English class time. Helps students understand the structure of language and comprehend the principles of traditional grammar by using innovative means. 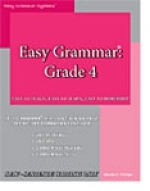 Easy Grammar has Teacher's Worktexts and Student Workbooks from 2nd Grade up through High School. They described in detail on their individual pages according to grade level. An ideal introduction to the understanding of language usage and skills. Learning prepositions first helps eliminate confusing nouns and pronouns from the beginning. Grammar for grades 7 and up.